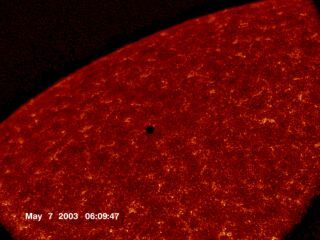 The planet Mercury transiting in front of the sun in 2003, captured by a NASA satellite. This Monday (May 9), Mercury will appear to cross in front of the disk of the sun, and will be visible as a tiny black dot against the bright source of light. The event, which astronomers call a transit of Mercury, will occur only 14 times during the 21st century. As seen from Earth, only transits of Mercury and Venus are possible, because these are the only planets that lie between Earth and the sun. Transits of Venus occur in pairs separated by about eight years, with more than a century separating each pair. Using parallax during the transits of Venus, astronomers were given the best opportunity available to measure the distance from the Earth to the sun — known as one astronomical unit. Kepler's third law showed that with this one measurement, it was possible to then measure the distance between the sun and other planets, based on how long it took each planet to go around the sun. The distance from the Earth to the sun was poorly known at that time. Astronomer Edmund Halley — of comet fame — was the first to realize that transits could be used to measure the astronomical unit. The transit technique relies on the precise measurement of the exact moment when Mercury or Venus began moving onto or off of the disk of the sun; two centuries ago, measuring those moments with high accuracy was difficult. Nonetheless, elaborate expeditions to observe the transits of Venus in 1761 and 1769 provided astronomers with their first good value for the astronomical unit. Since the 1960's, this method has been completely superseded by radar measurements of the distances to the other planets in the solar system. A photographic plate shows the transit of Venus in 1882. The image was taken as part of an expedition, commissioned by the U.S. Naval Observatory and Transit of Venus Commission, to image the transit from different locations on the Earth. It was Johannes Kepler (1571-1630) who made the surprising discovery that, in 1631, both Mercury and Venus would transit the sun within less than a month of each other. Mercury would transit the sun on Nov. 7, followed by Venus on Dec. 6. The sight of a planet passing in front of the solar disk had never been seen before, so Kepler and his soon-to-be son-in-law, Jacob Bartsch, issued an "admonition" to all astronomers to be on the watch for these events. Because Kepler himself was uncertain about the exact circumstances (as he was concerned about the accuracy of his own tables), he urged prospective observers to carefully watch the sun a day early and, should nothing be seen, not give up until the day after. Unfortunately, early November 1631 brought a very stormy and unsettled period of weather to much of Europe. So far, as historians know, only three individuals actually observed the transit of Mercury and only one, Pierre Gassendi (1592-1655), left a detailed account. According to Gassendi's writings, he observed the transit from Paris, by means of projecting an 8-inch-wide (20 centimeters) image of the sun from his telescope's eyepiece onto a white screen. At around 9 a.m. local time on Nov. 7, through a scattered-to-broken layer of cloud cover, Gassendi anxiously watched the black dot of Mercury — which was much smaller than he had expected — as it slowly moved across the sun. Unfortunately, Kepler did not live to witness this event; he died on Nov. 15, 1630, almost a year to the day before the Mercury transit. Despite his fears that his calculations might be off by a day or two, Kepler predicted the transit within 5 hours of it actually taking place — an astonishing feat for that time. The safest way to watch the transit event is to project the sun's image through binoculars or a small telescope onto a white card or paper. This arrangement permits several persons to simultaneously view an enlarged solar image. Based on observations made during previous Mercury transits, the planet can be perceived as a tiny, black speck or pinpoint on the sun with as little as 7x magnification. A 2.4-inch or 3-inch refractor telescope with a 100x eyepiece is more than suitable, while at 150x, Mercury will appear as a round, black dot. Reflecting telescopes can be similarly used, but with instruments that have larger than a 6-inch aperture, it's best to use a mask to reduce the aperture to 3-inches or less. Training a large reflecting telescope on the sun for long periods can cause a build-up of heat on the mirror or inside the tube, potentially damaging the instrument. Mercury should be readily recognizable as a tiny, sharp-edged dot, having only about 1/160 the sun's diameter. Through the transit, this dot will gradually crawl across the sun's face. If there are any sunspots on the sun's disk, they will not appear quite as dark against the sun as the jet-black silhouette of Mercury. The planet Mercury transiting in front of the sun, as captured by a NASA satellite. Mercury is near the center of the image, while dark sunspots appear near the edges. After May 9, the next transit of Mercury will occur on Nov. 11, 2019. Once again, North America will be in a favorable position to see it. And, once again, observers in the East will be able to observe the entire transit, while for those in the West, the transit will already be in progress as the sun comes up. The 2019 transit will also be a couple of hours shorter than this year's, lasting about 5.5 hours. Mercury will transit the sun once again in 2032 and then in 2039, both times in November. However, the Western Hemisphere will be turned away from the sun and in darkness when they occur, rendering both invisible for skywatchers in the Americas. Not until May 7, 2049, will another Mercury transit be visible from this part of the world. So keep this in mind: Over the next 33 years, Americans will have only two chances to see Mercury pass across the disk of the sun. The first of those opportunities comes this Monday, so don't miss it! Here's to good luck and clear skies.